CardMonkey's Paper Jungle: Disney-Pixar Blog Hop: Card Set in a "Box in a Bag"
Disney-Pixar Blog Hop: Card Set in a "Box in a Bag"
It is my great pleasure to again participate in the original Disney-Pixar Blog Hop, as I have every time since its inception four years ago! Here, Disney scrap/craft fanatics from around the country create a wonderful blend of Disney- or Pixar-themed projects. 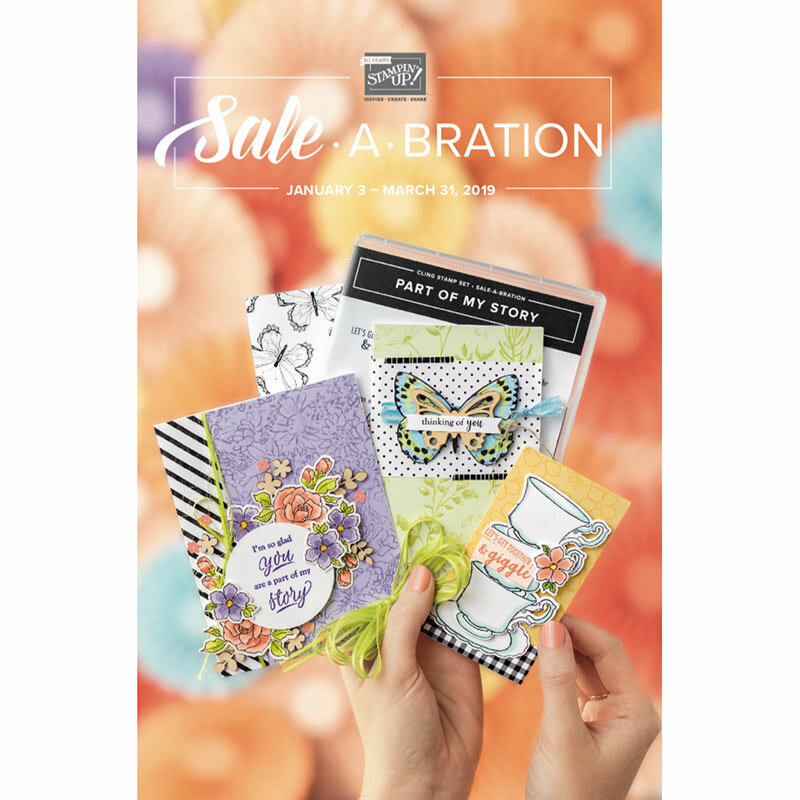 Trending this year in papercrafting is a hot new way to gift a set of cards. Called a "Box in a Bag," it creates a firm base around which a designer paper is adhered, and then the decorating is purely up to you! 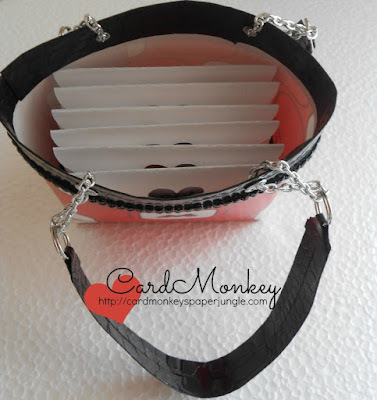 To make this bag, I first created a base from Close To My Heart Black Cardstock. The base was cut 5.5" x 3.5". I then scored 1" on each side and corner-cut each corner (diagonally) so the 1" sides could fold up to form a box bottom. I secured the corner tabs with Scor-Tape, and set aside. Next, I cut a piece of Disney cardstock (the red) 5" high x 12" wide. I secured Scor-Tape all around the base of the box and then wrapped the paper to the base, securing the paper around the base as well as vertically to close the wrap. I found a scrap of the black alligator-skin patterned paper in my stash -- I think I got it at Michael's, years ago. It would be perfect for my trim. I cut a piece 2" high x 12" long, and scored it lengthwise to create a crisp fold that I could put over the top of the bag. I also secured this with Scor-Tape. I finished off the edge of the trim with two lines of Resin Rhinestones ("Dazzling Diamonds") from The Buckle Boutique. Next, the handles. I decided I wanted to give it a little more of a finished look, so I created two handles from the black alligator-skin patterned paper, folding it on top of itself and securing with Scor-Tape. I put jewelry jump rings at the bottom edge and fed some jewelry chain through eyelets I punched into the bag with my Crop-A-Dile. Here's a peek at the inside of the bag, with the cards stashed inside. Next up, I made six notecards to fit inside the bag -- each has a finished size of 3x3" when folded. Complementing Disney paper was used for the rear three cards, just layered atop of matching cardstock scraps. 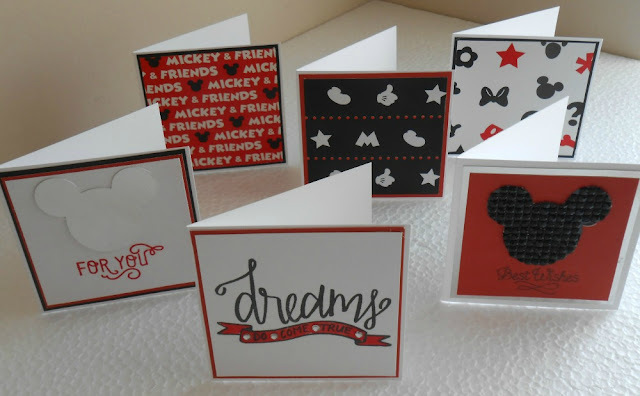 I created the Mickey head for two of the cards by welding circles together using the software with my Silhouette Cameo. The one on the left was cut using metallic silver paper -- hard to see in this picture, sorry. The one on the right was cut using the same rhinestone resin sheet from The Buckle Boutique. 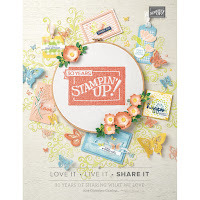 Those two Mickey cards were stamped using sentiments from Close To My Heart's August Stamp of the Month. The stamp in the front "Dreams Do Come True" is from a set in my stash. 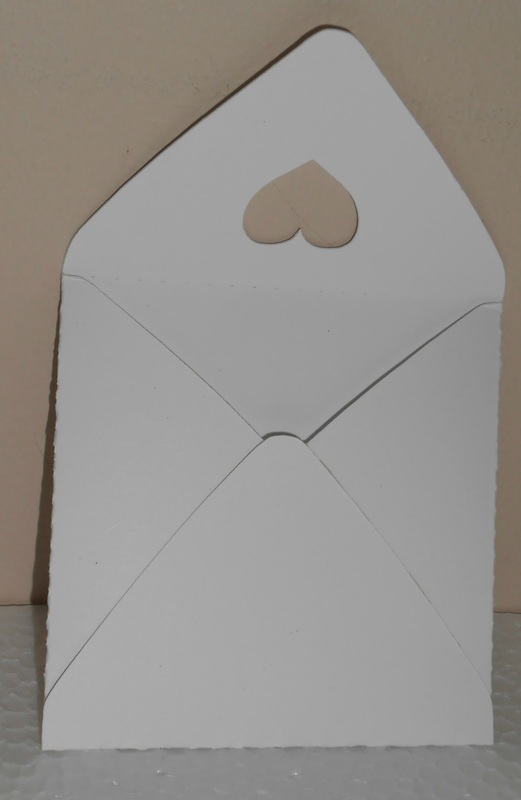 Finally, I needed to create an envelope to fit my wee cards. 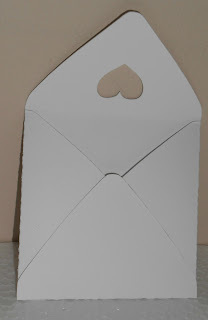 This square envelope with the heart on the flap is a file from the Silhouette Online Store, easily cut two-up on a 12"x12" mat, from Daisy White CTMH cardstock. Thank you for taking the time to learn how to make your own "Box in a Bag", and for joining me on the Disney Pixar Blog Hop. It's time now for me to move you down the road to the next wonderful project. Just WAIT until you see the fabulosity that Marisa has in store!!!! CLICK HERE to jump to Marisa's post. It is my pleasure to join this, the ORIGINAL Disney Pixar Blog Hop, again this year. I hope you enjoy our projects, and comment often! Oh my goodness this is the sweetest little bag and the holding a cache of sweet cards!!! nice job! This is adorable and can I say Beautiful TOO!! Love this amazing bag and card set. Great idea!! 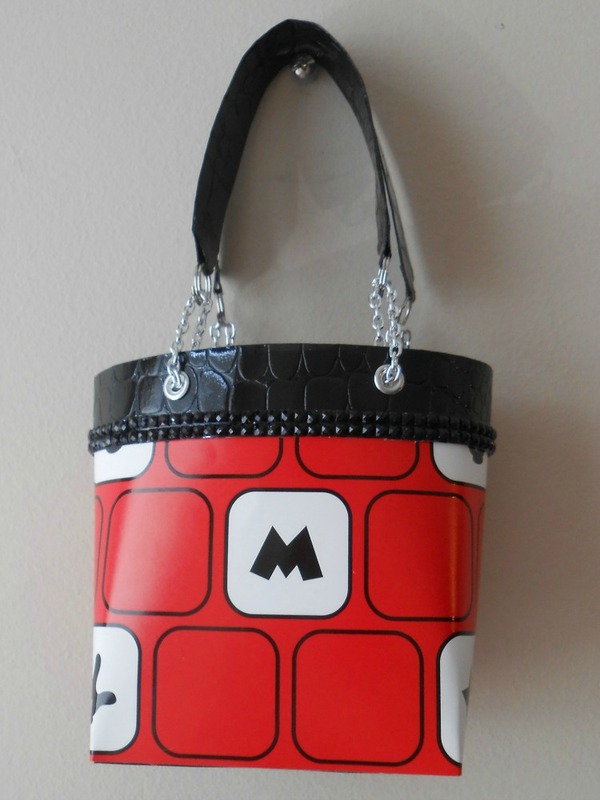 Super super cute and it even looks like a real handbag! Who wouldn't love it! When I first saw this post I thought "I want that purse!" I thought it was a REAL handbag! WOW! Nice, would make a great gift. This is just precious! Love the adorable little purse and the note cards are so cute! What a beautiful and lovely purse you have created, and thank you so much for sharing with us the way you made it. Great job!!! So very nice, I love it! omg..this is adorable. i love the little bag and the cards are just as cute. I am loving this idea! Oh but I'm intimidated, it might kick my crafting behind! It would be so cute to give my roomies for CTMH Convention!